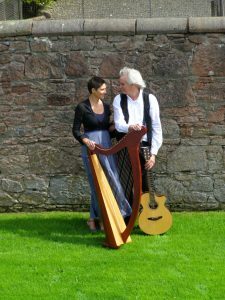 Celtic Twist - traditional Scottish Harp and Guitar duo. Celtic Twist ,traditional Scottish Harp and Guitar duo. They provide elegant back- ground music for weddings, anniversaries, dinners & corporate events adding a special touch to any special occasion. Celtic Twist is two highly talented musicians Philippa Holland, Clarsach and David Palmley on Guitar. Between them, they have a wealth of experience and have performed at every type of event throughout Scotland. Both David and Philippa sing, so if instrumentals only are required that is fine, but if a song is requested they are happy to sing. Phil and David have created a truly distinctive sound, with their unique arrangements and by combining the timeless romance of the guitar and the unmistakable beauty of the harp. They have produced several albums: The Visit, Twist in the Tale, The West Coast Sessions and A Celtic Twist Christmas. Celtic Twist is rooted in Celtic music but draws from Phil and Dave’s diversified musical backgrounds. . Their live performances offer an exciting and varied repertoire by alternating between the Guitar/Fiddle and Guitar/Celtic Harp combinations. Phil Holland is a classically trained musician, having studied at and graduated from the Royal Academy of Music, London. She received her teaching diploma L.R.A.M in 1986 and her performance diploma P.C.R.A.M in 1987. She worked as a freelance musician in London, playing in symphony orchestras, chamber groups and studio recordings for E.M.I and Decca, before relocating to Italy to play with the” A. Toscanini” Symphony Orchestra of the city of Parma for a number of years. From the early 90s onwards she started teaching extensively and opened her own school and youth orchestra called the” Divertimento Academy” in the cities of Crema and Cremona in Northern Italy. Before joining forces with Dave Palmley to form the duo Celtic Twist, she pursued a solo career as a harpist/singer/songwriter during which time she produced 5 CDs: Lagan, Stories, Going Home, Faeries and Seascapes, also performing extensively throughout Italy, France and Greece. Dave Palmley is a prolific and eclectic British singer/songwriter/guitarist. His music is principally rooted in pop/folk/rock, but draws also from many other influences, all of which can be heard in his song writing and instrumental compositions. With a freelance career spanning 3 decades, Dave has mastered a wide variety of musical styles, forming and performing with groups all over the UK and Germany, including live performances for German television.Driven by an insatiable passion and curiosity for music and song -writing, Daves guitar work (both acoustic and electric) and warm, strong, fluid vocals form the basis for many of his songs, but he also enjoys experimenting with a variety of other instruments including synths for his incidental and instrumental compositions.With Spargel Records, Dave brought out the album, Looking Closer in 1996, but prefers recording and producing all of his own material himself. Phillapa and David have created a truly distinctive sound, with their unique arrangements and by combining the timeless romance of the guitar and the unmistakable beauty of the harp. Playing many different styles of music from Celtic & Folk to Classical, and more, Celtic Twist is perfect for all occasions: concerts, ceremonies, receptions, Scottish theme nights, Burns Suppers, Corporate & private events. This duo will truly make your event one to remember! “Spectacular! Adds a quality to the atmosphere of the castle, enhancing the beauty of the surroundings. An evocative sound that taps into the senses!